Parasites: There are worms in my dog's water dish! If you see worms in your pet’s water dish, I have some good news: they are parasites, but they probably aren’t coming from your pet. Well, unless your pet is a tarantula or hissing cockroach, in which case it very possibly did come from your pet. Many years ago I got a call from a client that had found long, white worms in a water bowl. I sent the worms to Texas A&M University to be identified, and they turned out to be Gordian worms. Gordian worms are parasites, but they are parasites of insects and crustaceans. They have an interesting life cycle, similar to xenomorphs in the Alien franchise. Well, they would be similar to the xenomorphs if the xenomorphs controlled your body like a puppetmaster before bursting out of your chest. So, I guess they are similar but much, much worse. 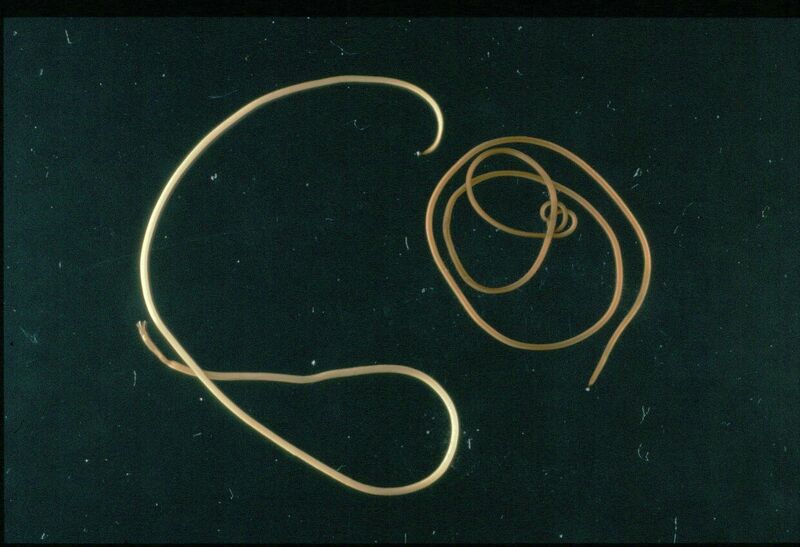 An adult Gordian worm lives in water, but the juvenile Gordian worms parasitize arthropods. How do the juveniles get inside of an insect? They encyst themselves on vegetation near the water’s edge, where they are then ingested by an insect eating the vegetation. The juvenile worm then lives inside the insect’s abdominal cavity until it is mature. What happens next is pretty amazing… the Gordian worm then tricks the insect’s body into jumping into a body of water, at which point it bursts out of the host insect and becomes a freeswimming adult worm. Parasites sometimes have amazing life cycles. These worms parasitize arthropods, not dogs or cats! Incidentally, the story of the Gordian knot (which is where this worm’s name comes from) is also interesting. According to the tale, Alexander the Great came to the town of Telmissus in Phrygia (what is known today as Turkey). A previous king (Midas, actually, so another king about whom there are well known stories) had tied an ox-cart to a post with an elaborate knot. It was said that whomever could untie the knot was the legitimate king of Phrygia. Alexander, as the story goes, untied the knot by slicing it apart with his sword, adding Phrygia to his empire. A Gordian knot has come to describe any particularly intractable problem or a tangle of rope. The Gordian worm is so-called because it often knots itself up, seemingly unable to be untied. 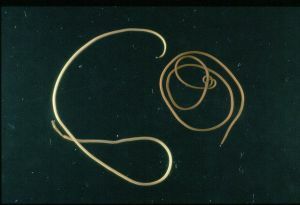 Parasites in your pet can be a knotty problem, but the Gordian worms in your dog’s water bowl did not come from your dog! That’s not to say that your dog doesn’t have parasites that you can’t see… and many of our pets’ parasites are transmissible to humans! That’s why it is important to schedule an appointment to see a veterinarian for regular wellness exams.